Periodical cicadas spend most of their lives as juveniles (also known as nymphs), living underground and sucking juices from tree roots. Depending on the species, they keep to this subterranean existence for 13 or 17 years before finally emerging into daylight. And they do so simultaneously in massive numbers. These newly emerged nymphs will climb on to a nearby tree to moult into winged adults. The life of an adult cicada is short and over in about a month. During this period they sing their hearts out and mate until they drop to produce the next generation of cicada nymphs which will return to the soil. But the cicadas aren't the only ones to get busy during this period. Scattered across the landscape are the spores of Massospora cicadina, and for over a decade they have been waiting patiently for the cicadas' return. Massospora cicadina is a parasitic fungus that targets all seven known species of periodical cicadas, and its effects on the host are devastating. Once infected, the cicada is done for - the fungal infection turns the cicada's abdomen into a chalky mass of spores. Surprisingly, despite missing a big chunk of itself, an infected cicada carries on as if it is business as usual - these diseased cicadas keep flying, singing and mating like their uninfected counterparts. But surely there must be more going on beneath that exterior of surprising normality. A group of researchers investigated if Massospora is doing more to cicadas than just robbing their booties. In particular, they were interested in whether Massospora is altering the cicada's behaviour, as many other insect-infecting fungi are known to do. Since the mid-1990s, they have been spending hundreds of hours documenting the behaviour of both infected and uninfected cicadas. They also collected some of those cicadas and kept them in captivity for closer observations, and played recordings of male cicada songs to them to see how they responded. There are two ways that cicadas can get infected with Massospora, and how they do so determines what kind of infection they end up with. If a cicada brushed up against some Massospora spores while emerging as a nymph, they end up with what's called a Stage I infection. However, if they picked up the fungus by coming into contact with an infected adult cicada, they would end up with a Stage II infection. Both are equally bad for the cicada, but there are some key differences between them. Cicadas with Stage I infection tend to crawl around a lot more and leave behind a trail of contagious spores wherever they go. In contrast, those with Stage II infection fly around more often. But aside from that there are also other key behavioural differences, and it relates to what all these cicadas have emerged for - mating. Male cicadas with Stage I infection respond to mating calls the way that female cicadas usually do - with wings flicks that are the cicada's equivalent of "Hey, I'm interested - come and get me!" Any amorous cicadas that respond to this gesture and mate with the infected male also end up contracting the deadly fungus. However those with Stage II infections simply ignored those calls and kept to themselves. This behavioural change in the infected cicada is more sophisticated that simply turning the male cicada to a "female phenotype". 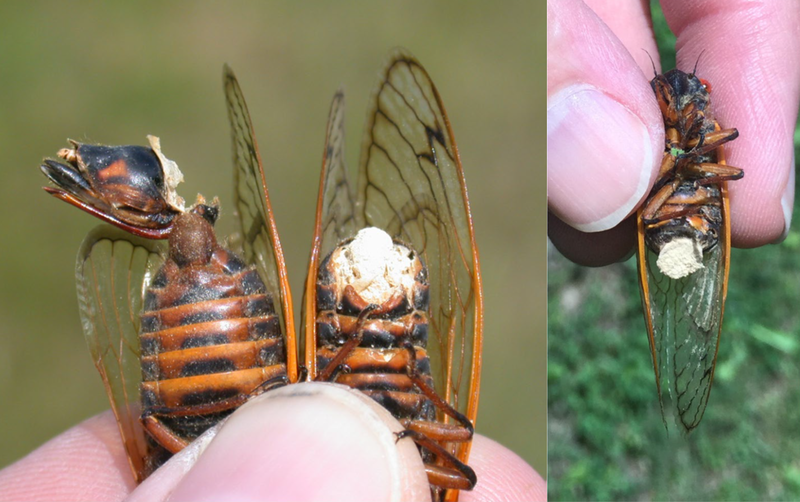 Aside from responding to calls with wing flicks, these male cicadas still behave like other males. The fungus merely added another behavioural response to their repertoire. So what about those with Stage II infection? Why don't they get in on the action? The spores produced by Stage I infections immediately contagious, so it spreads through the cicada population through physical contact (such as mating). Meanwhile, Stage II infections produce a different type of spores that cannot infect cicadas right away, but can stay dormant and viable in the soil for decades. These spores lie in wait for a future brood of cicadas to emerge, infecting the nymphs as they crawl out of the soil. In this case, the fungus doesn't need the host to be flirty and rub carapace with other cicadas, they just need it to be a diligent little crop-duster that sprinkle fungal spores all over the landscape. By doing so, Massospora is well-prepared for the next emergence event, when the festival of frantic cicadas and fungal booty-snatchers can start all over again. Cooley, J. R., Marshall, D. C., & Hill, K. B. (2018). A specialized fungal parasite (Massospora cicadina) hijacks the sexual signals of periodical cicadas (Hemiptera: Cicadidae: Magicicada). Scientific Reports 8(1), 1432.